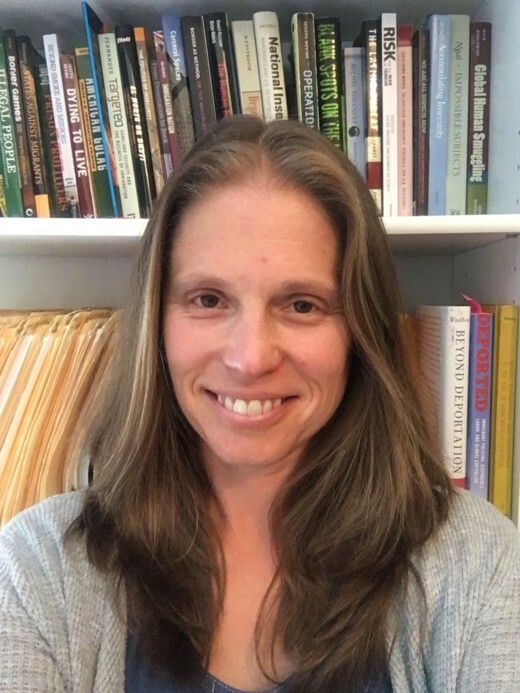 Hiemstra's research focuses on migration and border policy-making, immigration enforcement practices (especially detention and deportation), constructions of borders and sovereignty, and Latin American migration. Overarching themes in her writings include the role of immigration policy in national identity, processes of racialization and securitization, and ideas of borders and belonging. Hiemstra is a member of the Detention and Asylum Research Cluster and the Crimmigration Control International Net of Studies. "The Danger of Building Detention Economies," Nancy Hiemstra, The Hill, June 22, 2018. "Chaos and Crisis: Dissecting the Spatiotemporal Logics of Contemporary Migrations and State Practices" (with Alison Mountz). Annals of the Association of American Geographers 104, no. 2 (2013): 382-390. Considers why alarmist discourses of chaos and crisis emerge frequently in policymaking and scholarship on migration. Argues that states mobilize constructions of chaos and crisis to create exceptional moments in which sovereign reach and geopolitical influence are expanded. "Beyond Privatization: Bureaucratization and the Spatialities of Immigration Detention Expansion" (with Deirdre Conlon). Territory, Politics, Governance 5, no. 3 (2016): 252-268. Draws on a study of immigration detention in Essex County, New Jersey, with a focus on the contractual arrangements delineating detention between public and private entities and actors. Posits processes of bureaucratization as central to the growth in immigration detention. Intimate Economies of Immigration Detention: Critical Perspectives (edited with Deirdre Conlon) (Routledge, 2016). Provides crucial new insights into immigration detention recounting at close range how detention's effects ricochet from personal and everyday experiences to broader political-economic, social and cultural spheres. Draws on original research in the United States, Australia, Europe, and beyond to scrutinize the increasingly tangled relations associated with detention operation and migration management. "Examining the Everyday Micro-Economies of Migrant Detention in the United States" (with Deirdre Conlon). Geographica Helvetica 69 (2014): 335-344. Argues that tracing the political and economic geography of money inside detention facilities is critical for understanding detention expansion and its consequences. "Geopolitical Reverberations of US Migrant Detention and Deportation: The View from Ecuador" Geopolitics 17, no. 2 (2012): 293-311. Draws on research in Ecuador with families of migrants detained in the United States and deportees. Shows that the impacts of detention and deportation policies extend spatially and temporally beyond U.S. borders, and into local, personal spaces and places in Ecuador. Suggests that the detention and deportation do not meet U.S. policymakers' stated objective of deterring future migration. "Performing Homeland Security within the US Immigrant Detention System" Environment and Planning D: Society and Space 32, no. 4 (2014): 571-588. Scrutinizes the behavior of detention personnel and the experiences of detainees through research conducted in Ecuador with detained migrants' families and deported migrants. Argues that the detention system works performatively to bolster contemporary imaginaries of homeland security.